Sure, it’s hard to tell the person you plan to spend your life with that you’ve got $20,000 in credit card debt, but it’s even harder to tell that kind of news to your new spouse after the wedding. 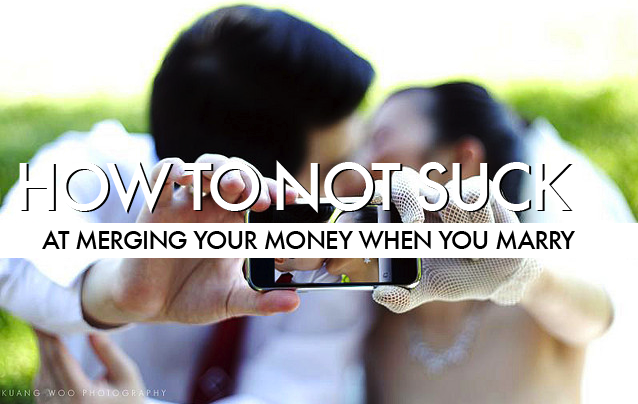 However ugly your finances, you need to get it out before the wedding bells ring. Seriously — how can you plan for a life together if one partner isn’t being honest? And you certainly don’t want to be denied a mortgage after finding the perfect white-picket fence home because you didn’t tell your spouse about your crappy credit score. You should both write a list of all your household expenses. This should include fixed expenses such as rent and car payments. Next, write a list of your joint discretionary expenses — money you don’t have to spend but you choose to — such as eating out or a trip to the movies. Finally, you should each write a separate list of your personal discretionary expenses — the stuff on which you spend money for your benefit alone — such as haircuts, clothes shopping trips and the like. Many couples come into a marriage with two very different incomes. Some couples choose to divide the household expenses evenly, but you might consider splitting those expenses based on what each partner earns. For example, say Joe earns 40% of the total household income and Mary earns 60%, perhaps she would be responsible for 60% of the rent. Then look at your personal expenses and decide which will be paid for individually and which should be part of your joint budget. And be fair. If you think your facials should come out of the joint budget, don’t get mad when your partner wants to use joint cash for the neighborhood poker game. To avoid those kinds of fights, in your budget, create columns for “yours,” “mine” and “ours,” and come to an agreement on how much money you can each spend without “permission” from the other. Decide how you’re going to pay the bills. Some couples find success by opening a joint account into which each partner deposits their contribution to the monthly bills, while others like to keep their money completely separate. Still others dump every penny into the community pot. There is no right answer — you have to talk to your partner to decide what’s right for you as a couple. With either strategy, make sure you’re clear on who is responsible for physically paying the bills so you can avoid late fees and other awfulness. Also think about paying bills online through your bank’s web site so you can both access and monitor all the goings-on of your money. 1. Pay down debt: Create a plan to pay off your debts, and decide who is responsible for them. If only one spouse has owes money, decide if that spouse alone will be paying it off or if it’s a team effort. Follow some of these tips to start digging out. 2. Emergency fund: Money pros say you should have between three and six months of expenses in a liquid savings account. This is money that you shouldn’t touch unless there’s a dire financial emergency. Decide to set money aside each month — just like a regular bill — until you hit your target amount. There are several online tools available, like this BankRate.com calculator that can help you do the math. 3. Make plans for long-term savings, such as for retirement. Calculate 401(k) and IRA contributions as part of your budget, and make sure you’re both saving at least enough to take advantage of the company’s match. Also discuss other long-term goals, such as buying a house, and create a savings plan to accumulate what you’ll need for your down payment. Change your beneficiaries on retirement accounts and insurance policies, assuming you want your spouse, and not your sibling or mom and dad, to get your stuff when you’re gone. You’ll soon be filing your tax returns jointly, which means you may want to make some changes to your payroll withholding. Use this calculator from the IRS for some help. Make sure to update your estate planning documents to reflect your marriage. If you plan to change your name, make sure to do it on all your documents, credit cards, investment accounts and yes, your bank accounts, too. Even when you’ve taken all the steps in this post, your job isn’t done. You need to keep talking to your spouse about your finances. Pledge to have a monthly meeting to discuss the bills, and then every six months, meet to go over account statements for debt and savings so you can see your progress and make any changes you need to stay on track. Also consider this: If you decide that one person will be in charge of the bills and the investing, be sure the other spouse knows what you have and what you owe. Should the bill payer drop dead, the other spouse will need to take over. Make it easy for non-managing spouse by starting a “When I’m Dead” file.